During World War II the U.S. Navy had built up a classified  team of engineers to build codebreaking machinery  for both Japanese and German electro-mechanical ciphers. A number of these were produced by a team dedicated to the task working in the Washington, D.C., area. With the post-war wind-down of military spending, the Navy grew increasingly worried that this team would break up and scatter into various companies, and it started looking for ways to covertly keep the team together. The result was Engineering Research Associates (ERA). Formed in 1946 , this contract engineering company worked on a number of seemingly unrelated projects in the early 1950s. 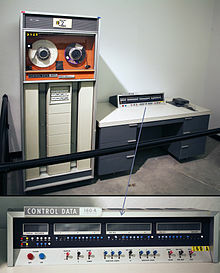 Among these was the ERA Atlas, an early military stored program computer, the basis of the Univac 1101, which was followed by the 1102, and then the 36- bit ERA 1103 ( UNIVAC 1103). The Atlas was built for the Navy, which intended to use it in their non-secret code-breaking centers. In the early 1950s a minor political debate broke out in Congress about the Navy essentially "owning" ERA, and the ensuing debates and legal wrangling left the company drained of both capital and spirit. In 1952, Parker sold ERA to Remington Rand. Although Rand kept the ERA team together and developing new products, it was most interested in ERA's magnetic drum memory systems. Rand soon merged with Sperry Corporation to become Sperry Rand. In the process of merging the companies, the ERA division was folded into Sperry's UNIVAC division. At first this did not cause too many changes at ERA, since the company was used primarily to provide engineering talent to support a variety of projects. However, one major project was moved from UNIVAC to ERA, the UNIVAC II project, which led to lengthy delays and upsets to nearly everyone involved. Since the Sperry "big company" mentality encroached on the decision-making powers of the ERA founders, they left Sperry to form the Control Data Corp. in 1957,  setting up shop in an old warehouse across the river from Sperry's St. Paul laboratory, in Minneapolis at 501 Park Avenue. Of the members forming CDC, William Norris was the unanimous choice to become the chief executive officer of the new company. Seymour Cray soon became the chief designer, though at the time of CDC's formation he was still in the process of completing a prototype for the Naval Tactical Data System (NTDS), and he did not leave Sperry to join CDC until it was complete. CDC started business by selling subsystems, mostly drum memory systems, to other companies. Cray joined the next year, and he immediately built a small transistor-based 6-bit machine known as the "CDC Little Character" to test his ideas on large-system design and transistor-based machines. "Little Character" was a great success. In the early 1960s, the corporation moved to Ford Parkway in the Highland Park neighborhood of St. Paul where Norris lived. Through this period, Norris became increasingly worried that CDC had to develop a "critical mass" in order to compete with IBM. In order to do this, he started an aggressive program of buying up various companies  to round out CDC's peripheral lineup. In general, they tried to offer a product to compete with any of IBM's, but running 10% faster and costing 10% less. This was not always easy to achieve. The tape transport was followed by the 405 Card Reader and the 415 Card Punch,  followed by a series of tape drives and drum printers, all of which were designed in-house. The printer business was initially supported by Holley Carburetor in the Rochester, Michigan suburb outside of Detroit. They later formalized this by creating a jointly held company, Holley Computer Products. Holley later sold its stake back to CDC, the remainder becoming the Rochester Division. Train printers and band printers in Rochester were developed in a joint venture with NCR and ICL, with CDC holding controlling interest. This joint venture was known as Computer Peripherals, Inc. (CPI). In the early 80s, it was merged with dot matrix computer manufacturer Centronics. Meanwhile, at the new Chippewa Falls lab, Seymour Cray, Jim Thornton, and Dean Roush put together a team of 34 engineers, which continued work on the new computer design. One of the ways they hoped to improve the CDC 1604 was to use better transistors, and Cray used the new silicon transistors using the planar process, developed by Fairchild Semiconductor. These were much faster than the germanium transistors in the 1604, without the drawbacks of the older mesa silicon transistors. The speed of light restriction forced a more compact design with refrigeration designed by Dean Roush. In 1964, the resulting computer was released onto the market as the CDC 6600, out-performing everything on the market by roughly ten times. When it sold over 100 units at $8 million ($65 million in 2018 dollars) each it was considered a supercomputer. In the same month it won its lawsuit against IBM, CDC announced its new computer, the CDC 7600  (previously referred to as the 6800 within CDC). This machine's hardware clock speed was almost four times that of the 6600 (36 MHz vs. 10 MHz), with a 27.5 ns clock cycle, and it offered considerably more than four times the total throughput, with much of the speed increase coming from extensive use of pipelining. Since these two projects competed for limited funds during the late 1960s, Norris felt that the company could not support simultaneous development of the STAR and a complete redesign of the 8600. 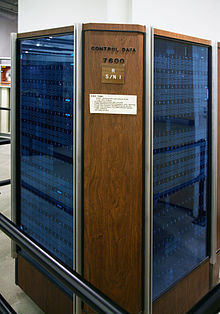 Therefore, Cray left CDC to form the Cray Research company in 1972. Norris remained, however, a staunch supporter of Cray, and invested money into Cray's new company. In 1974 CDC released the STAR,  designated as the Cyber 203. It turned out to have "real world" performance that was considerably worse than expected. STAR's chief designer, Jim Thornton, then left CDC to form the Network Systems Corporation. Magnetic Peripherals Inc., later Imprimis Technology was originally a joint venture with Honeywell formed in 1975 to manufacture HDDs for both companies. CII-Honeywell Bull later purchased a 3 percent interest in MPI from Honeywell. Sperry became a partner in 1983 with 17 percent, making the ownership split CDC (67%) and Honeywell (17%). MPI was a captive supplier to its parents. It sold on an OEM basis only to them  while CDC sold MPI product to third parties under its brand name. It became a major player in the HDD market. It was the worldwide leader in 14 inch disk drive technology in the OEM marketplace in the late 1970s and early 1980s especially with its SMD ( Storage Module Device) and CMD (Cartridge Module Drive), with its plant at Brynmawr in the South Wales valleys running 24/7 production. The Magnetic Peripherals division in Brynmawr had produced 1 million disks and 3 million magnetic tapes by October 1979. CDC was an early developer of the eight-inch drive technology with products from its MPI Oklahoma City Operation. Its CDC Wren series drives were particularly popular with "high end" users, although it was behind the capacity growth and performance curves of numerous startups such as Micropolis, Atasi, Maxtor, and Quantum. CDC also co-developed the now universal Advanced Technology Attachment (ATA) interface with Compaq and Western Digital, which was aimed at lowering the cost of adding low-performance drives. Despite having valuable technology, CDC still suffered huge losses in 1985 and 1986 while attempting to reorganize. As a result, in 1987 it sold its PathLab Laboratory Information System to 3M. While CDC was still making computers, it was decided that hardware manufacturing was no longer as profitable as it used to be, and so in 1988 it was decided to leave the industry, bit by bit. The first division to go was Imprimis. After that CDC sold other assets such as VTC (a chip maker that specialized in mass-storage circuitry and was closely linked with MPI), and non-computer-related assets like Ticketron. Finally, in 1992, the computer hardware and service businesses were spun out as Control Data Systems, Inc. (CDS). In 1999, CDS was bought out by Syntegra, a subsidiary of the BT Group, and merged into BT's Global Services organization. They Live (1988), by John Carpenter — As Roddy Piper is trying on his new "sunglasses" that allow him to see the world as it is, he looks at an advertisement for Control Data Corporation and sees the word OBEY. The film's credits include "special thanks" to CDC. ^ Frisch, Michael (Dec 1972). "Remarks on Algorithms". Communications of the ACM. 15 (12): 1074. doi: 10.1145/361598.361914.